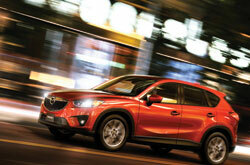 Stylish and functional, the 2014 Mazda CX-5 has everything you could ever want in a compact crossover. Donning sleek curves, sharp headlamps, smooth lines and a badge-shaped grille, the CX-5 is incredibly appealing and has become an attention-grabber for the nameplate. Brand-new components make their grand debut on the crossover for 2014 in the form of one fresh safety feature, HD radio and Pandora Internet radio. Both Touring and Grand Touring models also receive a larger four-cylinder engine, providing additional power. To learn more information about the 2014 Mazda CX-5 in Houston, check out our short summary below; then scroll down for extra details on its specs. Putting more emphasis on the CX-5's safety standards going into 2014, Mazda has introduced a new safety function on the latest edition of the crossover: Smart City Brake Support. The new system works by using a laser sensor to identify stationary objects in front of the vehicle and then automatically braking, if the driver fails to, to avoid a collision. Additional components complementing the program include antilock brakes, front/side airbags, traction control and stability control - mentioned in many 2014 Mazda CX-5 reviews. Aside from the new braking system, the Mazda CX-5 also makes room for HD radio and Pandora Internet radio in its Bluetooth Audio package, giving drivers a range of audio technologies to take advantage of. 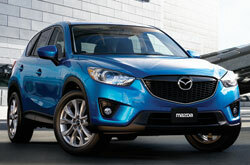 Fun to drive and incredibly fuel efficient, the Mazda CX-5 comes with two engine options. The first, a 2.0L four-cylinder powertrain, delivers 155 horsepower and 150 lb.-ft. of torque, and is available on an all-wheel- or front-wheel-drive configuration. It's also paired with a six-speed manual transmission and comes exclusively on Sport models. The second, a 2.5L four-cylinder engine, is new this year and comes outfitted on Touring and Grand Touring models. Producing 184 horsepower and 185 lb.-ft. of torque, it comes with a standard six-speed automatic transmission and is also available in front-wheel and all-wheel-drive configurations. We're absolutely sure that the CX-5 is right for you. 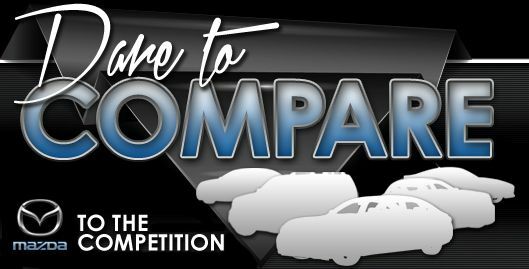 That's why we offer tools that will allow you to compare Mazda's most current model side-by-side with the 2014 Toyota RAV4, Volkswagen Tiguan and the Chevrolet Equinox. 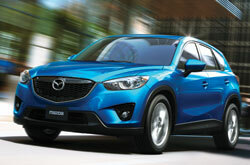 The CX-5's got several great attributes, including its leading-edge onboard technologies and handsome looks. Compare its price to the vehicles in its class and you'll see that it's a truly amazing value, which is one of the main reasons why so many Houston drivers select it. For more details, check out the CX-5's quick-facts list below this text. Welcome to the Joe Myers Mazda review of the new CX-5. After reading our overview above, if you decide the CX-5 isn't the perfect vehicle for your needs, please check out other 2014 Mazda reviews in our research gallery. It's a hassle to find hard facts about a multitude of cars in one spot. That's why it's OUR job to offer reviews from experienced auto critics, so you have access to these tools on one site. Filled with ultra-precise information and specs, each passage gives you complete details about all the CX-5 has to offer Houston drivers in terms of cabin features and much more. Is the CX-5 not right for you? Use our Mazda reviews and car comparisons to learn about other highly-rated vehicles on the lot at Joe Myers Mazda.